Dorothy Holden, a native of Natchitoches, is the 2018 Louisiana School for Math, Science, and the Arts School Support Employee of the Year. She is beginning her seventh year with the school and has been praised by students, faculty, staff and alumni as one of the most caring and supportive individuals at LSMSA. 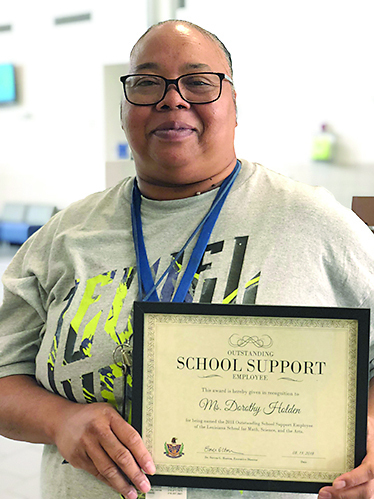 The Outstanding School Support Employee Award is part of a program designed in 1990 by the La. Department of Education and the La. Board of Elementary and Secondary Education to recognize non-instructional personnel that have given of their time and talents beyond the call of duty.